Wind whips through your hair and sparkling ocean waters whiz by as you cruise up the coast – that’s how movies portray the fun driving experience. This year The Fast Lane Car (tflcar.com) rolls over that notion. The 2014 Toyota 4Runner, with its rugged good looks and adventurous off-roading capabilities, has been named to tflcar.com’s fifth annual Top 10 Most Fun to Drive Car Awards. 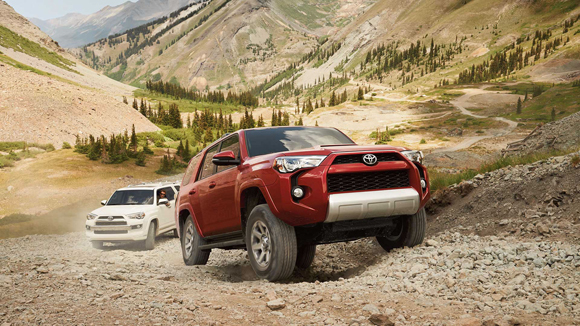 The 4Runner is the only body-on-frame sport utility vehicle (SUV) to make this year’s 10 list, which includes luxury brands, performance vehicles and consumer favorites. To qualify, vehicles had to be a 2014 model year and driven/tested by tflcar.com’s staff within the 2013 calendar year. “These automobiles may or may not be the fastest, the most powerful, or the most expensive, but they are certainly the most interesting cars that we’ve driven in the past year, and that’s why we’re proud to announce they made our list,” said Roman Mica, tflcar.com publisher.